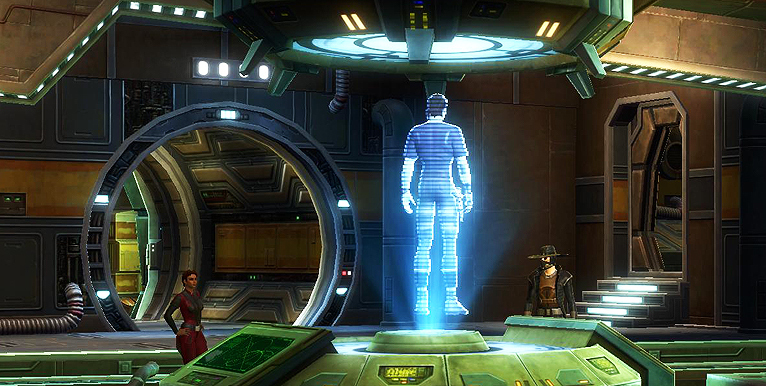 Warning: This post contains spoilers for the prologue of the Smuggler storyline in Star Wars: The Old Republic. To see a spoiler-free summary of the storyline please check this page instead. Are your morals too loosey goosey for the Jedi Order? Do you prefer to be your own boss instead of enlisting in the Republic Military? Is the Space England accent of the Empire too hoity toity for you? Well my friend, you may have a future in smuggling. Ah yes, the Smuggler. 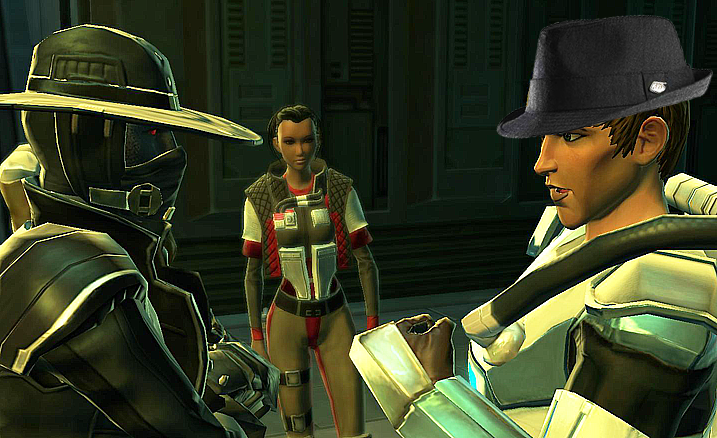 That class that sort of doesn’t make sense in the grand scheme of this two faction system we call The Old Republic. You don’t really have any invested interest in the Republic winning beyond the Empire is probably gonna check your cargo hold more often and give you more discerning looks at the docks. I mean heck, the bounty hunter has more ties into this whole war due to the fact that the Mandalorians are semi-permanently hired en masse by the Empire, but you? The smuggler has no real official ties to the Republic when the story starts. Heck, you are pretty much on an imaginary third side where you don’t like the Republic, but are scared of the Empire more so, and thus enemy of my enemy… is still my enemy? So what do you get for a story when you have nothing at stake in this cold war? Well… a lot of fun actually. Let’s take a look at the Smuggler Prologue. Knights are born heroes, Consulars are the top of their class, Troopers are members of the most elite troop in the military, and you, dear smuggler, your story begins with you getting your ship stolen and getting duped by two timing weasel. If that doesn’t set the tone for you, nothing will. Yes, the story of the smuggler is one of the underdog fighting for his cut in the world in seems. On a routine potentially less than legal delivery of some weapons to a local crime boss/”importer” working for an even bigger crime lord, a dirty backstabber going by the name Skavak steals the weapons and your ship and heads off. Now unless you can get those blasters back, you and the crime boss named Vidu are gonna to be having an unpleasant visit from your mutual employer: Rogun the Butcher. I’m sure he got that name because he LOVES to make roast beef sandwiches. So the job quickly turns from deliver blasters to get blasters back or get dead, and the only way to find out that is to figure out where Skavak was taking them. He mentions in his last holo transmission that he was apparently working for the separatists so that’s a great place to start. And the easiest way to do that is to get the data from the Mannett Point computers, but how? Well it just so happens that Vidu has an old buddy that knows how to smuggle goods through the back tunnels of Mannett Point, so it’s time to pay him a visit and drop off some supplies for the intel. You show up and find out the supplies are for him and his… uh… lady friends? The implications are kinda scuzzy in my opinion. But it also does something for the tone of the story. This isn’t a trooper. This isn’t a jedi. You are not necessarily on the right side of the law. You are essentially a criminal, granted a criminal that may have a noble cause, but a criminal nonetheless. And as such you get to see the seedy underbelly of everything. Including books on bird watching! Yes, apparently the secret to getting into the tunnels below Mannett Point are disguised as a treatise on bird watching that you get the code to decipher. Ugh. Reading. About birds. Such is the trials and tribulations of the lowly Smuggler. No damn Jedi have a mission to go read about birds for hours. But you get down into the lower area and slice into the computers, with the possibility of some fun antics with the separatists. Which highlights yet another difference in the Smuggler story compared to some of the others: It’s funny. Like really funny. Not just a general chuckle here and there. But the smuggler can easily be played for full on yuks if you want. Hell, his first line when you start the game can be an instant dismissal of how you immediately hate being on Ord Mantell. If the Jedi Knight is an epic hero tale, the trooper is a war story, then the Smuggler is a wacky buddy comedy at its heart. Or it can be at least. But it’s so unique in that regard why wouldn’t you play it that way? Following retrieving the files, your friends back at the base start working on cracking it while they send you on a mission to make a bit of cash to hopefully distract Rogun. A suicidal wacky side quest to go meet an insane old man and get his “Boom Juice” and bring it back. The quest is honestly just filler, but continues the comedy vibes of the smuggler’s tale. The old man you meet with is particularly humorous with his strange remarks of confirming that you are definitely not a gundark and other weird quips. His wife immediately offers you dinner as soon as you run into her as well. They’re like a homelier and more insane version of Miracle Max and his wife from the Princess Bride almost. Though Billy Crystal is missed here. After the boom juice death run (or if you are like me, you just quick traveled with the stuff as soon as you got it) the files have been cracked open and you’ve got a lead on Skavak. Seems like he’s got a meeting with the Separatists inside their secret volcano base. Secret… volcano… base? The heck? Do they also have sharks with laser beams? Or at least ill tempered mutant bass? Anyway, it’s off to stop Skavak, get the blasters and save the ship! Except this time you’re not going alone. Vidu is sending you with Corso. Oh Corso. How I hate you. I honestly believe Corso is one of those love/hate companions. I don’t know many who have experienced long periods of time with the boy and not developed a sense of fondness or utter loathing for him. When playing my smuggler it seems that “SHUT UP CORSO” has become a reoccurring catch phrase for the entire class story. I don’t know if it’s his country bumpkin attitude, old fashioned ways, or simply his insistence on being overly chivalrous that makes me want to punch him. Like he wants to be a white knight for everyone, unless it involves his own revenge fantasies. THEN it’s okay. So you get through the uh… *cough* SecretVolcanoBase… only to find that Skavak ain’t there. Naw. He tricked them just like he tricked you. Stole a robot too. An old beat up useless robot that no one would ever want or find a use for. Well, if that’s not foreshadowing, I don’t know what is. 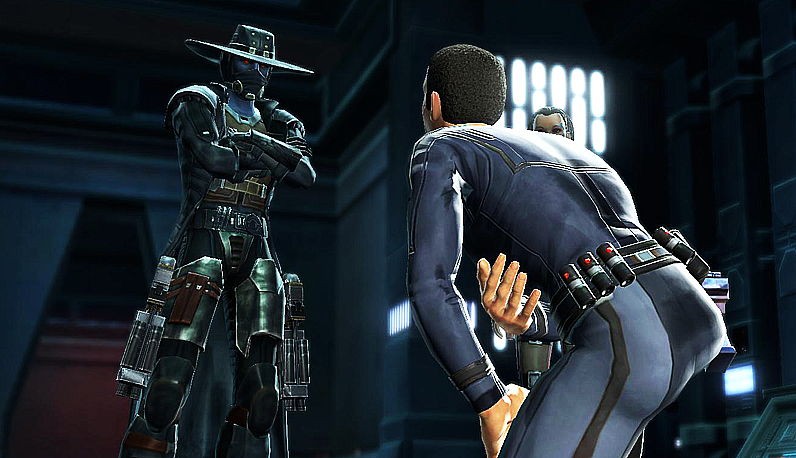 The separatists start a fight because if you’ve played through Ord Mantell before you know they ain’t that bright. Corso wants to kill them because his family was killed by separatists. Fine, whatever shuts you up. But not before it’s revealed that Vidu’s girlfriend was actually working with Skavak the entire time! Vidu’s girlfriend that you had the option to flirt with. A lot. Heh… heh… ehhh… Okay, I said already that we’re dealing with the scum of society right? So it’s a rush back to the base to confront her and find out where Skavak’s gone. Turns out she’s killed Vidu and Skavak is mid-dumping her as you walk in. Bad day? She spills that Skavak is on Coruscant, and then you get the option to kill her. I don’t believe much in second chances when it opens you to getting shot in the back so I killed her. Oh yea. Course that gets Corso’s boxers in a bunch about how you shouldn’t treat girls that way, it ain’t right. God damnit, Corso. Not ten minutes ago you shot a defenseless man who never did a thing to you in cold blood. DON’T GO SOFT ON ME CORSO. And then on your way out, Rogun the Butcher has sent bounty hunters after you. So clearly, the boom juice didn’t go far to getting him off his back proving once and for all that it was just a pointless fetch quest so you’d go and get all your travel points on the map. The bounty hunters die with NO complaints from Corso and we’re off to the Big City! Ah Corsucant, city of dreams. And buildings. Lots of buildings. It’s kind of easy to see why Skavak would run to Coruscant. The various levels of the city are swamped with the worst scum outside of the Empire and there are lots of places to hide. Pretty much right off the boat we are treated to a reminder of exactly where in the social strata the smuggler falls, as you have to hack the customs machine to recognize a false ID so you can get in while Corso distracts a security droid. I suppose since you technically had your own ship, you didn’t have to deal with official channels THAT much before (or considering how quickly you trick the system into thinking you are an admiral, maybe way too much.) Of course now that you are in, the question of how to find Skavak is the real task. Corso suggests finding a gambler/info broker named Darmas Palloran. Darmas is quite happy to help put you on the right track with his various contacts, and because he was friends with Viidu and doesn’t want to take advantage of a man down on his luck with no ship, he does so for free. He points you first to a slicer for the Migrant Merchant’s Guild (worse gang name ever) named Kixi. Turns out Kixi is being held there against her will to do the Guild’s bidding and is happy to not only undo the scrubbing clean she did of Skavak’s record, but also dirty it up even more (my favorite is noting that Skavak is an undercover agent for the Republic. Ouch!) So after all that you are given a choice to either free Kixi likes she wants, keep her locked up because you might need her still, or just kill her. I don’t know about you, but killing someone who is essentially enslaved who happily helped you is probably one of the scummier things you can do in a prologue. And I’m including the Empire here. I can maybe see the whole keep her locked up because you might need her, but what exactly is her incentive to help you the next time? Oh yes, you totally will get free *snrk* this *chuckle* time… for *HA! * realsies. I generally just let Kixi go free. That gives her incentive to help me in the future cause I helped her, and is not a totally monstrous thing to do. After completely ruining Skavak’s record, your next tip from Darmas leads you into Black Sun territory to find a holo-recording of Skavak’s meeting with the gang. It appears that our good buddy Skavak is having issues with the law now as well, as a Sullustan cop – whose name I couldn’t be bothered to remember but I remember is had alliterative M’s so I shall call him Meow Mix for now – is hot on his trail and Skavak wants Black Sun to deal with him. So it’s off to the spaceport to save Meow Mix, who reveals that Skavak stole a precious gem that the Sullustans worship. Meow Mix mistakes you for a good hearted, noble, and helpful citizen and deputizes you with the deal that you will track down Skavak together. Darmas’ next lead has you headed into Justicar territory to meet up with some punk teens with bad attitudes that apparently have zero education beyond what they learned wandering around the pipes of Coruscant (they call cameras ‘Droid Eyes’ and have no clue what the actual name for them are). Mostly it seems a throwaway mission to pad it out because all you do is rescue the brother of the sibling duo from the justicar jail (the jay-jay if you will) because only he knows where Skavak went and also happen to find Meow Mix there, who you can leave in there or let him out. All you that you gather is that Skavak made a run for the Works, the industrial machinery area below Justicar territory and I refuse to believe that the sister DIDN’T know that because the elevator that goes there is 25 feet away from their hideout. Or maybe they don’t know what an elevator is either. People tube or something. Damn kids and they’re lingo. You finally find Skavak deep in the works meeting with some of his imperial buddies where he trades the gem for some “gruesome trophy” that is being delivered to his (read: YOUR) ship. Meow Mix then makes the scene and confronts the Imps, demanding the return of the gem and then gets himself shot. I should have left his funny face back in the jail. He might still be alive then. So you blast the Imps, watch Meow Mix die, find out the gem is a fake, and high tail it back to the hangers to get your ship back from the sleazy ship salesman who is holding it for Skavak. On your ship, you find a bunch of weird cargo. An old robot, a weird alien mutt, a carbonite frozen person, a head in a jar, and a pretty lady. Wait. Lady? Ah yes. Risha. Risha is your new boss apparently. She offers you a simple deal, help her deliver all this stuff and she’ll lead you to the fabled treasure of Nok Drayan, a gangster who accumulated more wealth than some outer rim planets and then hid it before his death. Her former partner in this endeavor – Skavak – was (surprise surprise) unreliable, so now she’s offering you the same deal which naturally angers Skavak and pushes the plot into Chapter One. The smuggler story is just plain good fun. It has a light hearted feel with plenty of jokes, but it doesn’t do any of it at the expense of the story. I loved the story here. It was one of those plots that seems really simple until you look at it in hindsight because then you start noticing things like what Skavak is actually trying to do. The old robot? The grisly trophy? All things Risha needs to trade with. It all seems random and petty, but as you go forward it all builds and builds and that continues all through chapter one as you’ll see. The only thing I didn’t like – and this is strictly personal – is Corso. Oh the force, does Corso grate me. The joke when we play at home is whenever Corso says anything, it’s pretty much immediately followed with “Shut up, Corso(tm).” We had to trademark it because it’s a fricking slogan for the class thus far. I don’t know if it’s just the country bumpkin act or the blatant hypocrisy of “We can kill people in cold blood as long as they are tangentially related to our problems but don’t you dare be mean to girl.” I’m not saying that women should be hit, and by no means is that any kind of default response. I’m not donning a fedora on this. But killing someone who just joined up with the separatists for something other separatists did YEARS ago is fine, but don’t you dare harm a woman who we just caught backstabbing us, selling us out, killed our boss, and is working with the guy who royally screwed us and lying about it is somehow crossing a line that shan’t be crossed? Bite me, Corso. So that’s my take on the prologue for the Smuggler storyline. Hope you enjoyed, and I’ll be back soon-ish with more Class Storyline reviews. I want to say Trooper Chapter 3 should be done next. So here we are again. Another class in my sights. This time I’ve decided to do it a bit differently, and I’ll probably try to keep these reviews more so in this format than the previous one with the Sith Inquisitor. Namely it will be more of a general overview of the story, with much less detail on the individual worlds that they take place on. There will still be some spoiler-ish material, so please be warned, but I won’t go into the individual world story lines and instead focus on the general story of each act and my opinions of it. So let’s see if this works a bit better for people. So, the Jedi Knight – a classic hero archetype if there ever was one. I personally played a very, VERY light side Jedi Knight because they really appeal to that idea of the self-sacrificing heroic lawful good paladin. I only racked up a total of 150 dark side points and most of that comes from skirting the Jedi Code with Miss Kira, but we’ll get to that later. For now let us set our sights on the prologue of the Jedi Knight’s tale. The first twenty levels are a very slow build up. A mysterious fallen Jedi has been rabble rousing the local flesh reavers into a frenzy and its up to you to stop him. The story on Tython doesn’t really play too much into the overall story much at all really. All it does is establish you as someone who knows how to get the job done to the Jedi Council so they can send you off to your first relevant mission. But it’s not a bad little self contained story. The mystery is somewhat interesting and the interactions give you a lot of chances to be a goody goodie or a mister bend-the-rules-Jedi. Including a chance to flirt with some of the locals. There’s some nice minor twists in the plot that keep it somewhat interesting for the extent of the ten levels you’ll be going through it. During your time on Tython, you’ll meet fascinating characters like your master, Master Whats-his-face. No seriously, this guy has next to no personality other than his fabulous voice acting. He’s gruff, he believes that the Force has a plan for all of us, and you’re first padawan in some time. Other than those details, you don’t get much from him. Hell, I got a better impression from Kira’s former master, Kiwiks, than I ever did from my own master. Yet despite only training under him for a short time before you are made a knight and sent off to Coruscant, you’re supposed to develop this deep Father/Child like relationship with him that plays out. I guess this is a lot like Obi-Wan in the original films. Luke trusted the crazy old man in the desert a wee bit too quickly in my opinion. Even if he hesistated on the idea of coming with Old Man Kenobi to Alderaan, he bought the whole “I knew your dad.” thing without a second thought, and do we really need to remember the first in a series of overdramatic NOOOOOOOO’s we get in the series comes from Luke seeing Obi-Wan get smacked by Vader after only knowing the guy for what seems like maybe a day or two. Crap, Luke didn’t even get that worked up about his Uncle and Aunt dying and they freaking RAISED him. Anyway, in short, Master Whats-His-Face is Obi-Wan. The other couple of characters you meet include your first introduction to Kira Carsen – your soon to be padawan and potential love interest for the guys (Fetish here! Get your Teacher-Student fetish here! Only 15 levels in! Get it while it’s hot! ), Master Satele Shan, daughter of Gary and Mary Stu, and the best companion in the entire storyline: T7! Which I am sad to admit I didn’t get to use nearly as much as I wanted because I was a Guardian advanced spec. Seems to be my lot in these games, I never pick the right abilities to use the cute companions. Didn’t need Blizz for my Powertech either. But T7 is hands down one of the most delightful and entertaining companions in the game. Perhaps it’s the simplistic nature of his DroidSpeak? “T7+Jedi=Best Friends Forever” is a pretty darn adorable way of communicating. Plus T7 is always so eager to help, optimistic and cheerful. I honestly felt a bit bad when T7 would give me a -1 Affection eye roll. I mean, if Kira or Doc does it – screw it, have a gift – but for T7 I felt like I let the little guy down. Anyway, after busting the bad Jedi, getting your saber, and becoming “Your Name Knight of the Republic” – a title that has no punctuation, so it seems like your last name is Knight, which is even funnier with a legacy name since that becomes your middle name (Vrykarion Vrykerion Knight… of the Republic) – you are finally sent on your way to Coruscant. Coruscant is more or less the actual prelude to act one of the story, but it comes off as completely unnecessary. You spend 6-10 levels wandering around the city attempting to track down a Sith lord that has stolen the files on several secret military weapons around the galaxy. There’s a bit of twist at the end when they reveal who the Sith lord actually was, and even more so that he’s the son of a bigger and more important sith lord. This essentially gives the Daddy Sith Lord a reason to hate you for the whole of act one and to send his goons after you. That however is where the problem for me lies. He doesn’t NEED a personal reason to come after me. I am a Jedi Knight that is on a mission to stop him and his plans to build a doomsday device. The whole “you killed my son” plotline does nothing but bog it all down. Instead of fighting off his servants to save the worlds from military experiments turned against their former masters, you get a bunch of nitwits picking fights with you over their bosses personal baggage. Was being a threat to his plan not enough of a reason to want me removed from the picture? As for characters, the Jedi gets the most companions the quickest out of any character I believe. Getting T7 on your starting world, and then Kira Carsen part of the way through Coruscant. 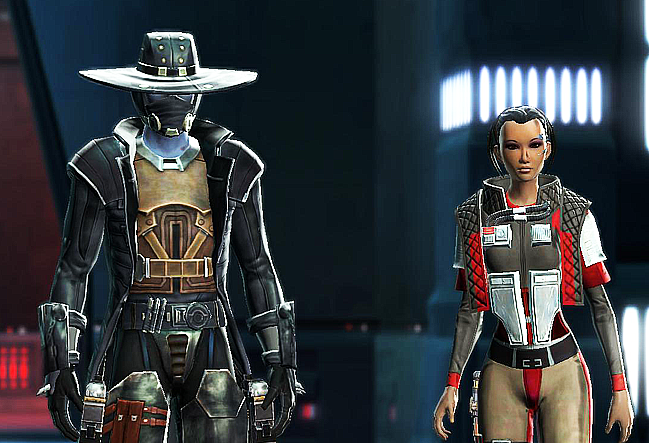 While it seems weird to be having your own padawan before you hit level 20, it’s fun to have Kira around. She has a nice rebellious Jedi thing that works well with both Light Side and Dark Side Jedi. The Light Side has a pupil that you can teach, and the Dark Side has what essentially amounts to an enabler. Kira also has probably one of the biggest interactions with the actual class storyline I’ve ever seen during Act One, but I think we’ll save that for when we actually discuss that storyline. However, because of that heavy narrative interaction it makes sense that you would get to know her early. Heck, you actually first meet on Tython when she’s sassing off with her then-master Kiwiks. On that note, is it normal for Jedi Knights and Masters to just pass around padawans like interns? Kira essentially gets handed off to you and suddenly she’s YOUR padawan. What happened to training with Master Kiwiks? Do I need to fill out some paper work? T7 on the other hand is just an adorable yes-droid/cheerleader. I love him. That’s all I have to say about that. In the end, the prologue for the Jedi Knight is decent at best. I have often compared to be the inverse of the Bounty Hunter. The Bounty Hunter starts amazingly and kind of dwindles in the second and third acts, where as the Jedi Knight starts simple and can be borderline boring but ramps up the epic storyline the further you get. Because of this, I supposed it’s a bit hard to judge the prologue on it’s own. There’s a lot of people I’ve seen get turned off on the class story because of this first bit, and it’s sad. All I can really say is – Yes, the storyline is a bit dull at the start. It’s the Fellowship of the Rings, lot’s of walking and talking and only a few colorful dashes of actions. But believe me, you’ll hit Two Towers/Return of the King territory soon enough and you will not regret playing this story at all by the end. But that’s a tale for next time when we delve into Act One. See you then! And as always, I appreciate any feedback on these posts as I figure out a good formula for them.